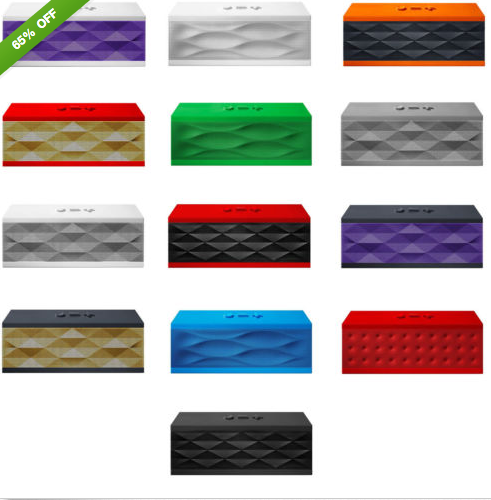 *HOT* Original Jawbone JAMBOX Bluetooth Rechargeable Portable Speaker – 13 Colors just $69.99 + FREE Shipping!! Reg. $199!! WOW!!! Hurry over to Ebay.com and you can snag one of the popular Original Jawbone JAMBOX Bluetooth Rechargeable Portable Speakers!!! Comes in 13 Colors!! They are slashed to just $69.99!! FREE Shipping! Reg. $199. Manufacturer Refurbished. Items come in bulk (non-retail) packaging with all accessories included: Jawbone JAMBOX, microUSB charging cable, 3.5mm stereo cable, carrying case, AC adapter and user guide. Cosmetically they look brand new. Please note that this is not the Big or Mini Jambox. Colors are already selling out — go to Ebay.com now!